Recently released from prison after a seven-year stretch, Stick is finding it hard to comprehend some of the changes that have taken place. Stick thought he had kept up … But maybe he had missed a few important events and passings. 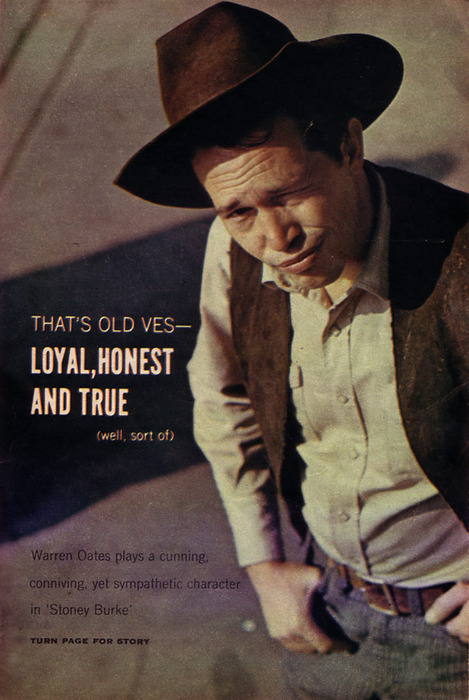 Nobody had told him when Warren Oates died last spring. He had heard about Belushi but not Warren Oates. Stick looked at the mirror, at the young millionaire trying to sound street …The street tone didn’t go with the words. Guy didn’t know how to stay in character… Trying to sound on the muscle now, a hard-nose. The guy should try for the movies. See if in about a hundred years he could take Warren Oates’s place. Jesus Christ, Stick thought. Warren Oates dead, you bonehead, could play it better than Erik Estrada.